After receiving an announcement earlier this month about a coming announcement, and then Blizzard announcing a special announcement event in San Francisco, Hearthstone's big announcement has finally been, well, announced. Today, Blizzard announced (last time, I swear) the next expansion to Hearthstone: The Grand Tournament. It will be a large card expansion, similar to the Goblins vs Gnomes expansion last year, with a total of 132 new cards. It will also introduce a new mechanic and keyword: Inspire. An Inspire ability will activate whenever you use your hero power, and designer Eric Dodds said the set has many more cards that interact with your hero power. Lore wise, the update is set just after the Argent Tournament world event first introduced in World of Warcraft’s Wrath of the Lich King expansion, which was a large tournament held by members of the Horde and Alliance to find champions worthy of taking on the Lich King. 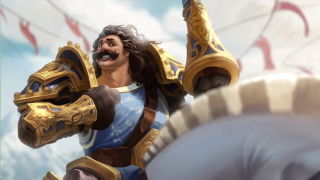 The Argent Tournament was been the predicted setting for Hearthstone’s next expansion, ever since keen eyes and ears found clues in the letter Blizzard sent us, including the Argent Tournament’s fanfare playing when we opened the package holding the letter. But Blizzard instead decided to create a new, sillier event centered around a tournament held in the same location after the Lich King had already been defeated. You won’t have to wait long for the update as it will be released next month, and you can pre-purchase packs starting next week to get an exclusive cardback. The Grand Tournament packs will be priced identically to the current sets. You can check out all of the cards announced so far here, and vote on which card will be revealed next on the Hearthstone website. Update: Blizzard also revealed that with the launch of The Grand Tournament, the Arena will reward a random pack from any of the three available sets, instead of from the same set every time as it has been previously.